Small parish church with C12 and later fabric; largely rebuilt in 1875 by Robert Griffiths in the Decorated style. MATERIALS: Stone rubble with freestone dressings. Timber-framed porch; tiled roofs. PLAN: Nave and chancel with W end bellcote and S porch. EXTERIOR: In the S wall of the nave is a blocked C12 doorway. This has a roll-moulded round-headed arch with colonnettes with cable mouldings and carved capitals and a tympanum decorated with hatched triangles. W of this is the timber-framed porch with bargeboards with blind quatrefoils in roundels. The porch has been restored and rebuilt on taller N and S side walls but the surviving flamboyant heads to the timber traceried sides appear to be original, as does the timber arched outer doorway with carved spandrels. The porch roof and bargeboards have been restored. The doorway into the church is round-headed with two roll-moulded round-headed arches and supposedly of 1875, but may be the north door seen by Glynne resited. The remainder of the exterior fabric is also of 1875 but may copy early window forms. Two-light Geometric Decorated style traceried W window below a large bellcote with trefoil-headed openings for two bells and a steep stone superstructure with iron cresting and a weathervane. The other windows are a mixture of Geometric style traceried designs and lancets. A chimney stack projects through the E end of the nave roof on the S side. INTERIOR: Small C12-style round-headed chancel arch of two orders. This has been thoroughly recut or replaced in the C19. The chancel has a C19 canted timber roof divided into panels. On the N wall of the chancel there is a feature considered to be a C14 Easter sepulchre. This is a gabled Gothic recess, the gable decorated with crockets and filled with pierced Geometric style tracery. A chest under the recess has a tier of blind trefoil-headed arcading. The structure has massively tall pinnacles on either side of the gable. The c. C12 font has a large plain bowl with a square section moulding above the later stem. Encaustic tiles to the chancel. The nave also has a C19 roof, arch braced with a ridge board with one tier of purlins. Jacobean pulpit and reader's desk in one with carved decoration below the cornice and tiers of panelling. C19 benches with ends with concave shoulders. HISTORY: The church was described in 1846 before restoration by Sir Stephen Glynne. 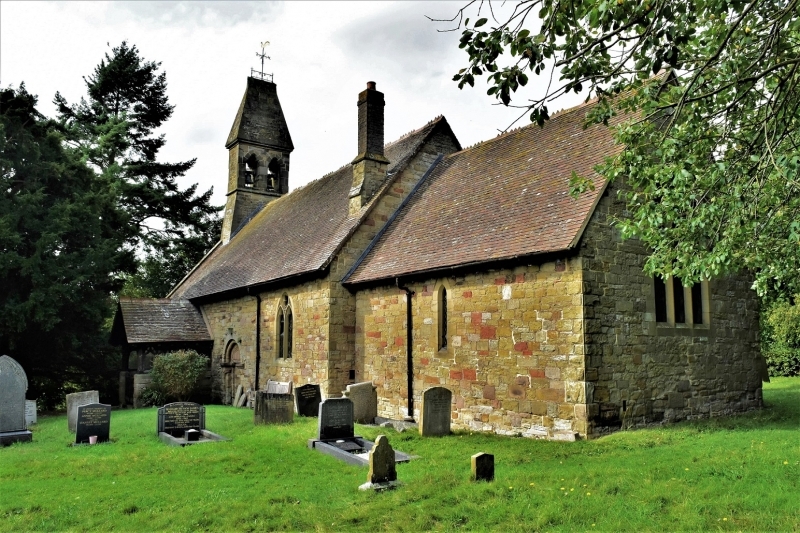 *	these features include a C12 S doorway with tympanum; C14 Easter sepulchre; c.late C15 timber-framed porch; and a Jacobean pulpit and reader's desk combined.